So, after my last post, I’m sure you understand why I did not approach Christmas with the full Dickensian appreciation this year. Indeed there were a few Scrooge moments and one of them occurred in a local bookshop, whose proprietor kindly wished me ‘Happy Holidays’. I really must perfect a response to this: ‘Happy Saturnalia’ perhaps? or ‘Happy Yule’? As an avid Terry Pratchett fan, perhaps I could get away with ‘Happy Hogswatch, HO HO HO’. Then I worried that perhaps I looked like the kind of person who wanted to be wished ‘Happy Holidays’. That’s the last time I go in there without brushing my hair. The other problem with my response to festive greetings is that I always have a split-second debate as to whether to wish ‘Happy Christmas’ or ‘Merry Christmas’. ‘Merry’ is more traditional and more Christmassy somehow but surely one would rather that one’s friends and acquaintances were happy, rather than merry? Happiness implies a deep contentment; being merry suggests gaiety and perhaps a touch of hysteria. The latter is perhaps closer to the mark as you leap into action to stop one twin pulling the Christmas tree over on himself and to prevent the other from swallowing her older sister’s Sylvanian Family rabbit’s tiara. I have had a lot of merry Christmases over the years and some of them have been really pretty dreadful. I was sixteen when my cousin, a young man in his twenties, was killed in an accident barely six weeks before Christmas. My increasingly-ill father would be dead in another two months. Another newly-married member of the family was determined, however, to celebrate Christmas in her new home with her young grandchildren and us. There was a certain quixotic bravery in trying to banish grief with gaiety like this but the resulting festivities were ghastly: with bells on. The following year, without my father, my Mother utterly refused to celebrate Christmas at home. We spent it with a distant cousin, went to church on Christmas morning in Salisbury Cathedral and had Christmas lunch in a pub. There was probably more wisdom than I realised in her decision but, at the time, what I took from it was that we weren’t a proper family any more, just the damaged remnants of one. So after that, I set out to out-Dickens Dickens at Christmas: multiple trees, multiple side dishes with the turkey, multiple guests. Christmas for sixteen wasn’t uncommon. My family was growing increasingly large and complicated. I dealt with the complications by disappearing to the kitchen and cooking increasingly large and complicated Christmas dinners. People became the props around whihc the perfect Christmas could be created. I’ll admit to a bit of passive aggressiveness too; I had acquired a relationship with someone whom we will call Relative-By-Marriage, who felt that turkey was Vulgar and Christmas best celebrated with a mince pie and an exceedingly small sherry. The year in which I produced fifteen different side dishes to go with the turkey and Relative turned in disgust, as more were bought into the dining room, and exclaimed ‘MORE food?’, was a year I really felt I’d scored. There was a lot of laughter. To do everyone in the family credit, we’d mostly mastered the art of laughing at life (or at least had learned to laugh when others laughed). And there was quite a lot of love in the middle of all the politics. Then there was the year when my mother spilled flaming brandy all over the Aga and a dear friend leapt gallantly to her aid with the first thing to hand — which was a tea towel … . And nobody is going to comment on what we did one Christmas when the pudding was turned out — and collapsed; what happens in the kitchen stays in the kitchen and it looked fine under all that flaming brandy. So laughter got us through and beauty. 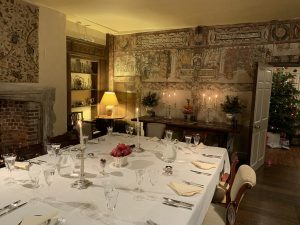 Nobody could set a Christmas table like my mother and the dining room leant itself to her loving care as the Tudor murals glowed in the candlelight. The Stilton was always wrapped in crisp white damask. There were myriad candles and cut glass bowls full of sugared almonds and the pretty little sweets and chocolates, which she was so good at finding. There would be a pyramid of clementines studded with bay leaves and all those precisely-chosen pieces of china and silver and glass. Of course, my mother did not live to see the last Christmas that she planned so meticulously and, three nights before last Christmas as her body was being carried down the stairs, the light in the hall went out with a flash. It was hard not to make something of that and when a friend turned up later that morning to decorate the table, as my mother had planned, I told her about it. “‘Oh God,” she groaned sepulchrally. “If I get this wrong, she’ll fuse the bloody lot.” At some point, quite soon after someone close has died, you need to laugh until your ribs ache and that was when I did. That remark pretty much saw me through that Christmas. My favourite cousins were there and we were merry because she wanted us to be merry. And so to this Christmas. We had a quiet day on the day itself: well I say quiet, we took the three children to church and that wasn’t quiet. And two days later, my brother and sister-in-law and my parents and brother and sister-in-law (the family in-law if you like) came to stay and I tackled the turkey. 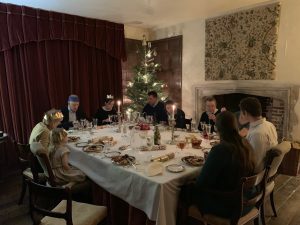 It was the first time we had all been together at Pittleworth at Christmas. I will confess to touches of rebellion. A few of my mother’s sacred laws were broken. She didn’t like flowers at Christmas and there were a few. She didn’t like wreaths either and there was one on the door and she would have shuddered at the trifle instead of the Christmas pudding. (I got to December 20th before I admitted to myself that I wasn’t going to make one this year). But this year was our Christmas now and there had to be a few bulwarks in place to block out the Ghost of Christmas Past and the lights stayed on, so that was alright. The thing that I shall remember about this Christmas are the gusts of laughter that swept through to the kitchen from the dining room. It was the rollicking, relaxed laughter from when people are having a good time in each other’s company. It was, I think and hope, happy laughter: the laugh of the Ghost of Christmas present. I felt utterly present this Christmas as, I realise, I haven’t for many years. I hadn’t expected to have a Happy Christmas this year but I had been determined to have a merry one ‘for the sake of the children’ and all that. And suddenly, to my astonishment, I got both and I hope and pray that my family, all my family, had one too. When you have a happy Christmas, you want to pass it on. I so hope you’ve had a happy Christmas and if it was merry as well, well all to the good. Thank you so very, very much for the kind and inspiring messages that so many of you left, they sent me into Christmas in a more positive frame of mind and got me thinking along the lines of this post. I am so grateful, especially when some of you have had very tough Christmases too, my thoughts and prayers are with you. I wish everyone a Happy New Year. This is the first year that I have really felt the wisdom of starting a new year after Christmas. It’s a good time to let the curtain drop. Let’s start banking the happiness against next Christmas.